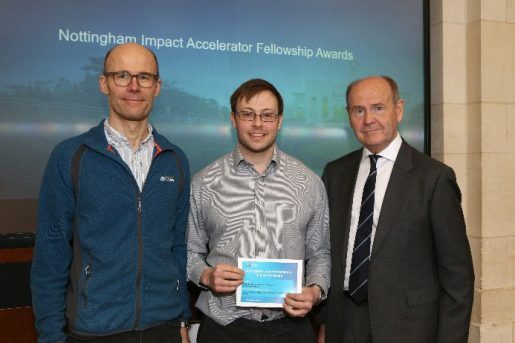 The Nottingham Impact Accelerator Knowledge Exchange Prize event took place on Friday 22 March in the Great Hall on University Park Campus. 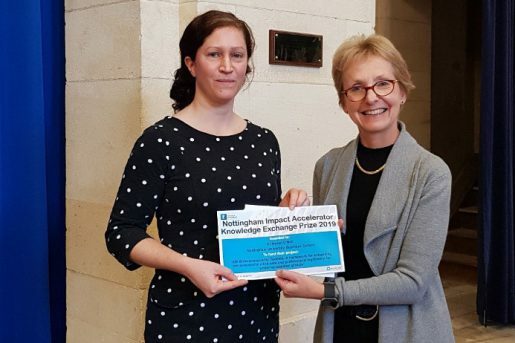 The event marked the inaugural year of the Nottingham Impact Accelerator (NIA), an internal initiative that draws together devolved Research Council funding streams to support translational research and knowledge exchange. The NIA is part of the University’s Knowledge Exchange strategy which aims to embed and support KE and impact across all disciplines. 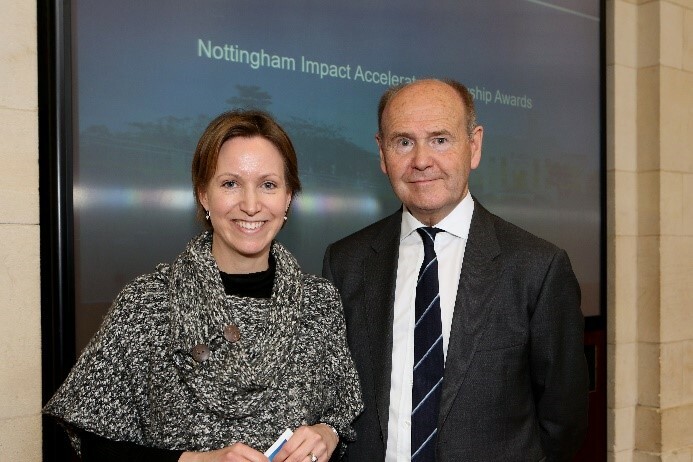 It awards around £2.2m per annum to support KE projects at Nottingham. If you have a KE project that you would like to progress we would encourage you to visit the NIA website or contact the NIA team. The NIA Hermes funding call to support the development of early stage KE projects across all disciplines, and the BBSRC and EPSRC IAA calls are currently open for applications. Registrants at the event heard from representatives of two previous NIA KE Prize winning projects: Dr Dani Ropar of the School of Psychology (‘Influencing practice and policy to help detention officers better support autistic individuals in police custody’) and Dr Ivey Geoghegan (Industrial secondment to LR Suntory). Pictures of Dr Dani Ropar and Dr Ivey Geoghegan with Sir John Peace, founder and former Chairman of Experian, at last year’s event. 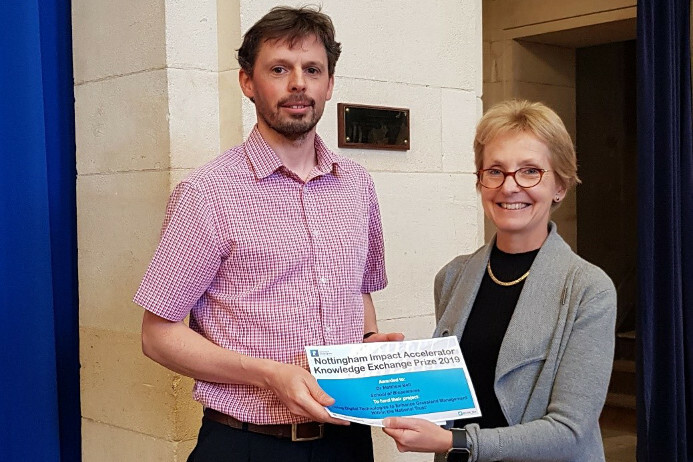 Professor Dame Jessica Corner, the University’s Pro-Vice Chancellor for Research and Knowledge Exchange, welcomed attendees and went on to announce this year’s winners, details of which can be found below. 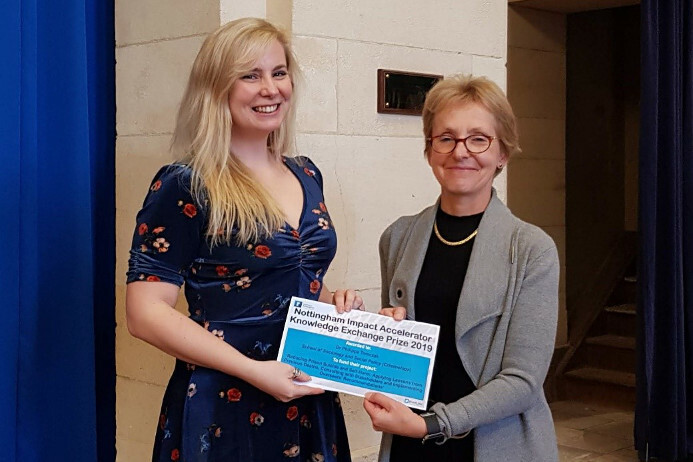 Dr Isobel O’Neil (Nottingham University Business School) with Professor Dame Jessica Corner.